Two of Our Warriors - Blakeman Transportation, Inc. The Blakeman Transportation family is proud to acknowledge two of its warriors. SPC Bryce Rees who has been deployed to overseas with the US Amy. 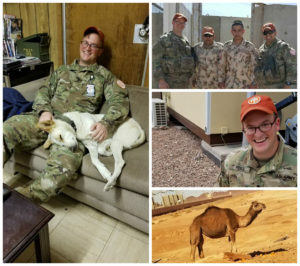 From left to right, you have Bryce lounging with his new best friend (he always finds a K-9 buddy no matter where he is in the world), new friends, a nice ‘selfie’, and a lovely photo of one of the worlds most ancient transportation…the Camel. High on gas mileage, low in comfort. 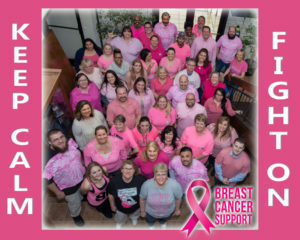 On Wednesday, February 28th, the Blakeman family wore pink to show support for long time employee (who at this time will remain anonymous) who is fighting the good fight with breast cancer. We are happy to report that she has recovered from surgery and is now on a different road that is traveled all too often. These are two very different battlefronts, but both exhibit the same tenacity and courage we all admire. You both are always in our thoughts and prayers.